This Strawberry cake with Strawberry Buttercream frosting is the most requested cake in our family. Although we tend to associate Strawberry recipes with the summer months, you will want this recipe for year round occasions. It is always present for either Thanksgiving or Christmas at our house. My hubby, Stacy has makes an occasional appearance on the blog. Usually it’s when he makes a yummy recipe like this one! This passed holiday season, he made this cake twice. The second time was a special request from his mother which is when he made the 2 layer cake. (Yes! My husband is such a sweetheart, he bakes for his mother!) The 3 layer cake in the photo’s is from Thanksgiving 2014. An easy Strawberry cake recipe sure to become a family favorite. Blend dry ingredients together with mixer at medium speed. Add wet ingredients and mix until well blended, about 2 minutes. Bake according to package directions for the white cake mix. Toothpick inserted in center will come out clean when cake is done. Because we were so very busy preparing for the Thanksgiving meal, I didn’t really take the time to make good blog worthy pictures, sorry. I did feel that I simply had to take a slice picture, the day after Thanksgiving using my beautiful Christmas cactus as a prop. I have no idea why the Christmas cactus always blooms at Thanksgiving but it does! Notice in the picture of the slice just how moist this cake is! This is one of the best cake recipes you will find. Just exactly the right amount of flavor and moistness with the most scrumptious Strawberry Buttercream Frosting! Add the ingredients to your grocery list and make plans for a cup of coffee, a slice of cake and conversation with a friend! I had to stop on your blog here and commend you on this cake recipe, I love the recipe and so looking forward to trying this cake recipe out, yum!! I love strawberry cake! My grandma always made this for me on my birthday! Thanks for sharing it at On Display Thursday! We all love here strawberry cake, and I really wish I could have a big slice. Lucky girl having a husband that bakes!!!!! This sounds delicious and would be so pretty for Valentine’s day. I can’t wait to try this. Your cake looks so yummy. Thank for sharing and linking up to Scraptastic Saturdays. Your post will be shared via Facebook, Twitter and Pinterest. Thanks for joining the party. This cake looks and sounds amazing! I have a relative that lives for anything strawberry and I think I may make this as a special birthday treat for her as her bday is coming up soon. Carrie, I hope you will come back and tell me about it when you make it for your relative! I think the Strawberry butter cream icing is absolutely the best! Thanks for taking the time to comment. How wonderful to have a husband who bakes delicious treats for the family! Strawberry recipes are much harder to find than some other flavors. I am excited to have found your family favorite. It looks like a keeper, so moist and flavorful! Thanks! I will be the first to admit that I am blessed to have such a wonderful husband! This recipe is so popular in our family, it has been a favorite for more than 10 years and still getting regular requests. I hope it will become special to your family as well. Thanks for stopping by. Oh Yummy!! Strawberry cake looks amazing!! Thanks for sharing on My 2 favorite things on Thursday!! Hope you come back next week!! Oh yum! I certainly am enjoying this. Thank you. I am pinning right now! He’s a keeper! I agree with you that strawberry cake is great any time of the year. My birthday is in February and I always had a strawberry birthday cake growing up. And, it was always shaped like a heart. Get Stacy a heart pan and see how it goes. We are coming into strawberry season here in central Florida, so I’ll be all over this recipe in a few weeks! We hope to buy some of those Florida strawberries in our grocery stores soon! In the meantime, those frozen one’s will have to do the trick. I’m putting them in my smoothies and loving it! You’re killing me. Strawberry cake is a family favorite. May I come over and ditch my diet? A man that bakes like this is so worth the age difference. Wink. Beautiful cake! Strawberry cake is just such a treat. The diet will just have to wait or we will have to walk an extra couple of miles one. I hope you get to make this cake for your family, Zan. It is far too cold to get out in the elements for the grocery store there in Chicago though! You all are probably more interested in hot soup and hot chocolate right now! Maybe you could make it for Valentines! This is such a pretty cake! Sounds delicious too, my kids love strawberry cake, we’re going to have to try this! Thanks Krista. Isn’t it pretty though and it’s a bonus that it is also delicious! I love Strawberry cake! My stepdaughter had strawberry cake for her wedding. I’m going to try this. I think I have all the ingredients on hand. Tell Stacy thanks. I will tell Stacy thanks. He will get a kick out of that. Let me know how y’all like the recipe. Stay warm up there! I know it’s cold in your neck of the woods! 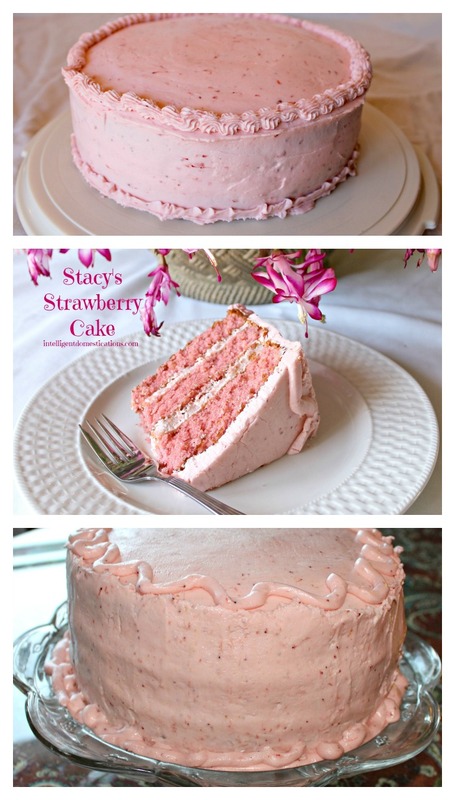 […] Stacy’s Strawberry Cake with Strawberry Butter Cream Frosting Intelligent Domestications Although we tend to associate Strawberry recipes with the summer months, you will want this recipe for year round occasions. My husband makes this fabulous Strawberry cake with Strawberry Butter Cream frosting for our family. It is the most requested cake in our family.